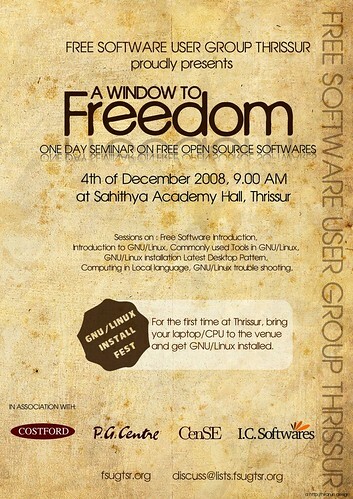 Welcome to the inauguration of Free Software User Group, Thrissur. This will be held on 4th December 2008. More details can be found on the FSUG Thrissur wiki page. As a member of FSUG Thrissur, I am unhappy to sat that I wont be there to attend the inauguration. I am having my university lab exams. But I will reach at the end of the event.